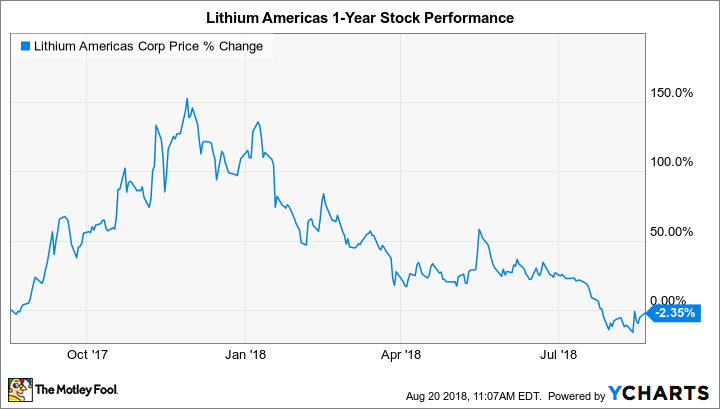 Does China's Latest Lithium Grab Make Lithium Americas Stock a Buy? Chinese companies are gobbling up equity in South American lithium projects. The latest move impacts a small cap lithium stock. If the global lithium market is a stage, then lately the only performers have been China and Sociedad Química y Minera de Chile S.A. (SQM) (NYSE:SQM). In May, China's Tianqi agreed to acquire approximately one-quarter of SQM for $4.1 billion. The transaction still has to pass regulatory scrutiny, but it would give the buyer a seat at the table (three if investors count board seats) in the world's most important lithium-producing region: the Lithium Triangle of South America. It's home to 51% of the world's identified lithium resources and an even greater share of the planet's total production. Then, in mid-August, SQM coughed up its stake in a 50-50 joint venture called Minera Exar to China's Ganfeng Lithium (GFL) to focus on projects in its home country. The transaction is valued at just $87.5 million, but it involves an important new growth project in Argentina that now will be one of the only major lithium projects in the region to not include SQM, Albemarle, or FMC Lithium (Livent Corporation). The majority owner will instead be Canada's Lithium Americas (NYSE:LAC), which will own 62.5% of the JV when the dust settles. On the one hand, losing the expertise of SQM could sting. On the other hand, GFL is a global leader in lithium production, too, and is also the largest shareholder of Lithium Americas with a 17% stake. Does the recent shake up make the small cap lithium stock a buy? Minera Exar began as a 50-50 joint venture between global lithium leader SQM and newcomer Lithium Americas. It was created to develop the Cauchari-Olaroz lithium brine project located in Jujuy, Argentina, which places it near plenty of existing infrastructure including lithium processing facilities, natural gas pipelines, highways, and road and rail access to seaports. That said, "existing infrastructure" is a relative term in the isolated region. That's one reason the project bears a price tag of $425 million. Production is expected to begin in 2020 and, once fully ramped up, Cauchari-Olaroz will produce 25,000 metric tons (MT) per year of battery-grade lithium carbonate. Assuming selling prices of $12,000 per MT, the project is expected to deliver $233 million in annual EBITDA and support 40 years of production. No matter how the project performs, Lithium Americas now will own 62.5% of production. It purchased an extra 12.5% of the JV once GFL came on board, partially funded with a $100 million loan facility provided by its largest shareholder. That brought the total debt and equity funding provided over the years by the Chinese company to the small-cap lithium producer to $272 million. The Canadian lithium company said it expects to immediately leverage GFL's mining and processing expertise to potentially improve the design of Cauchari-Olaroz. The Chinese company has experience extracting lithium from more challenging brines in its home country (which boast up to triple the production costs as South American brines), so there could be value in borrowing ideas from China. Whether or not that plays out as expected -- or makes up for the loss of SQM -- remains to be seen. Assuming any design changes don't delay the project past 2020, then Lithium Americas could stand to benefit from owning a higher stake in Minera Exar, even with the new $100 million loan facility factored in. But investors need to start paying closer attention to the balance sheet. The Canadian lithium miner ended June 2018 with almost no borrowings under its long-term credit facilities, but that could soon change. The company now has access to $305 million in credit available under three separate loan facilities. That significantly de-risks the financing aspect of Cauchari-Olaroz (and likely its earlier-stage project in Nevada), but much of the expected benefits hinge on lithium carbonate selling prices hovering near $12,000 per metric ton once production begins in 2020. That's an eternity in lithium markets. Consider that at the end of June spot prices in China were just over $15,000 per MT. That's relatively high, but it was the lowest level since 2015. Since Lithium Americas is selling Cauchari-Olaroz production at market prices for the first 20 years (80% of which will go to GFL), there's a bit more risk baked in compared to a long-term offtake agreement with more price protection. The recent changes at Minera Exar will give Lithium Americas a greater share of the potential profits once production begins in 2020. While losing the technical expertise of SQM could hurt, GFL provides a high level of competence in lithium production, too. That's why I think there are two more important factors for investors to keep an eye on. First, investors need to consider whether or not the new JV partners make changes to the design of Cauchari-Olaroz -- and whether or not that delays the project or increases the cost. Second, investors need to consider if the downward trend in lithium prices will affect the economics of the project, which will sell lithium carbonate at market prices. Given strong expectations for global lithium production growth in the next few years, market prices could fall below the $12,000 per MT mark that Lithium Americas has penciled into its estimates. Long story short, this remains a high-risk, high-reward lithium stock with plenty of potential countered by plenty of uncertainty. Investors looking to own a piece of the lithium industry may find it easier to own one of the major producers, but over time, those leaders will have to make way for ambitious newcomers. Lithium Americas could very well be one of them, although I'll be staying on the sidelines for now.